Hey, everybody. K. A. Parker with your final monthly update for the year 2018 before the new year kicks in. 2018 was a pretty good year, though I wish some things went one way instead of another. Around January, I made the intention to publish my first novel by June 2018. Obviously, that didn’t work out because you would have heard from me by then. Looking back, though, I can see that it was probably the right thing. The book was nowhere near ready for publication, and too much stuff was happening in the interim for me to pay attention to it properly. In February, I became a Dungeons and Dragons nerd. I’ve been officiating a campaign and playing in another since then, and I just finished up a one-shot (shorter game) last week. Definitely a highlight of my year. In March, I saw “Black Panther” and “A Wrinkle in Time,” two good movies that show Hollywood that films with Black characters and casting female black leads is always a good decision. On Christmas, just this past week, I watched “If Beale Street Could Talk” with my family, another movie that was a refreshing, much-needed breath for American cinema. In April, I got feedback from my alpha readers and sent my novel off to paid beta readers that gave me better suggestions. I kicked my writing into overdrive, and since then, I’ve been on Scribophile getting absolutely amazing feedback for it. In May and June, I kept working on the novel and learned what it means to be genuine in reaching out to others. In July, I tried exercise again, but that kind of flopped. Things are still weird in that department, but I’m taking things slowly. In August, I learned that going big is sometimes the right thing to do, not always, and that goes for creativity and exercise. In September, I got the most amazing feedback I could have ever asked for for my novel, and jumpstarted into October with a Scribophile premium subscription. And in November, I learned I’d be getting a job. So, yeah. Lots of ups and downs, but good overall. And it doesn’t have to be amazing. That’s just asking for too much trouble. I’ve never been a huge New Years’ resolution person. Whenever I’d make one, it just fell apart. 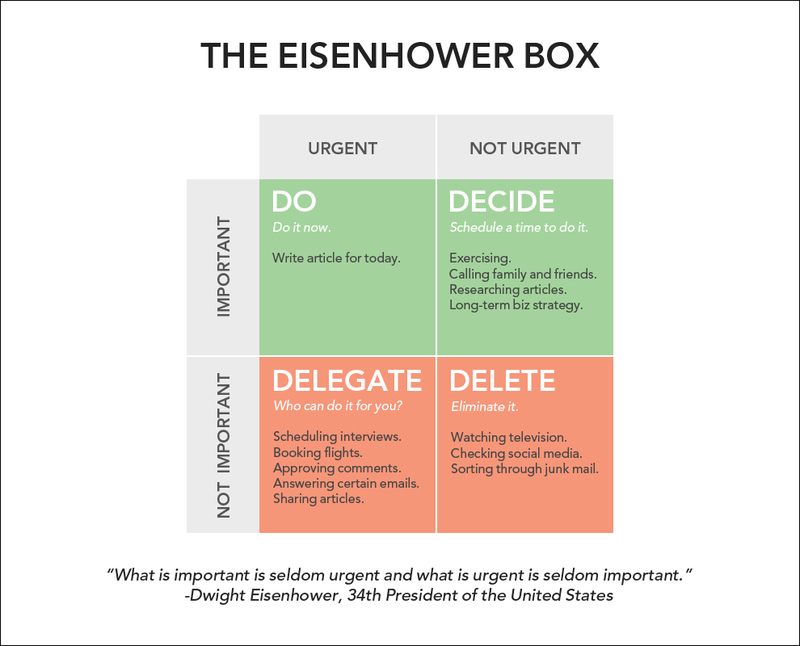 What I’m doing instead, however, is setting priorities through the Eisenhower Matrix. Whenever I found myself needing to something, be it big or small, I often found myself overwhelmed. Should I do it first? Should I do it later? Should I do that other thing I’ve been putting off? What do I need to do right this second? I don’t have a “delegate” box in my chart since I’m not a boss and don’t have underlings, but I still find all the boxes helpful to some degree. Writing tends to go in the second box since the deadline is further away and I can break up the task into smaller ones. Things like emergencies and anything related to my job I do right away because that’s important to me. Anyhow, I thin you see what I mean. I’m hoping to make use of those four boxes to keep myself on task and not get overwhelmed with my goals. There are many Android and iPhone apps for it, too. I prefer Ike’s version (not an ad or endorsement). But yeah. That’s my year and my December. See you all next month, and Happy New Year! I got into tabletop RPGs this year, too–not D&D because it’s expensive and complicated and my friends and I were beginners–and that’s been a highlight of my year as well! 🙂 I also have 2 games, one where I GM and one where I’m a PC. I got into them partly because of a blog post you wrote a while back that I remembered, so I felt that I should thank you. 😉 Anytime you want to write about your experiences with D&D I’d be happy to read it! Hope you have a wonderful 2019. D&D is cheap if you know where to look. The standard reference document might not contain all the bells and whistles as the Player’s Handbook (https://www.dndbeyond.com/compendium/rules/basic-rules), but it’s got enough for you to get your feet wet. Roll20 is also the Virtual Tabletop I use, as I’m not a huge fan of having physical minis and constructing maps. I prefer things to be digital. Also, it makes me so happy that I inspired someone to play ;A; Oh my gosh, thank you so much. I hope you have an RPG-filled 2019 yourself. Happy new year!